2229 East 34th St., Mpls, MN 55407 U.S.A.
We can accept lay-away payments for the coming Christmas season. We will deliver the tables free anywhere in St. Paul/Minneapolis metro area. Anywhere else, E-mail us about shipping costs. 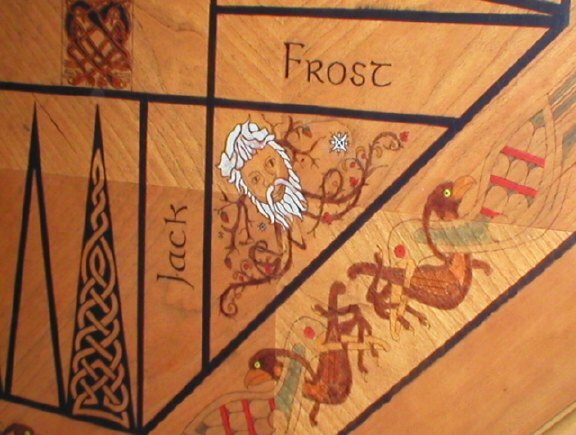 A three-lobed coffee table decorated with an original "Pictish" swirl design, and including three circles containing stylized Celtic musicians, with a "wind" section in one circle, the string section in another, and the harp, squeezebox and drummer in the third. Around the edge of the table is a paraphrase from the song "Molly O'Malley's": "Is this a place of many souls, or just one very large one. - Is this a place of many songs, or just one very long one." See a step-by-step description of how this table was decorated. 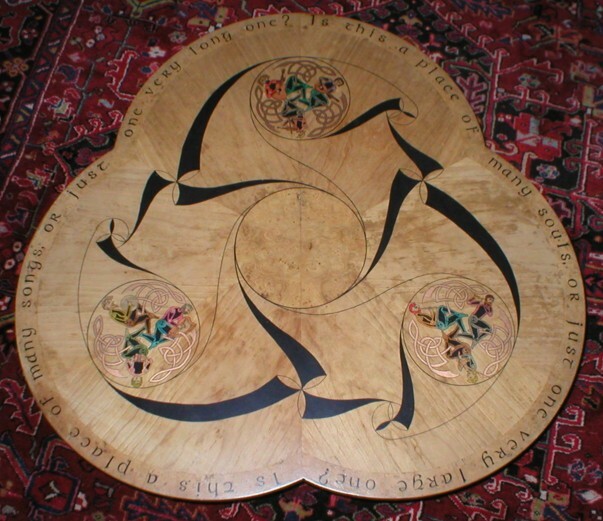 $ feet in diameter, this up-scaled bar table features a an overall spiral pattern take from the 7th century Book of Durrow one of the earliest illuminated versions of the Gospels found in Europe. The motifs for the 3 men amnd 3 dog patterns come from the Book of Kells measure less than and inch across int their original form. The horse are inspired by a stone carving in Scotland, and the birds are an original design. It includes a base for the table. The "Tables of the Four Seasons"
The concept for this table was inspired by a four-player Backgammon game nick-named the "Tables of the Four Seasons" which was described in a 13th century Spanish manuscript, Alphonso X's "Book of Games." The artwork help earn an "Masters Award" at the Minnesota Renaissance Festival. (View Illustration from MS). The table itself was a small dinette table found in an second-hand store, and was badly in need of refinishing, so I stripped off the original dark finish and applied my original artwork to the top. 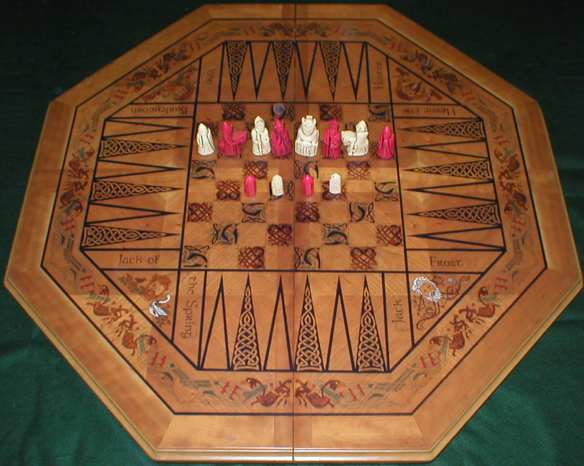 The table was meant to have a leaf which could be inserted in the center, but the leaf was missing when we found it, so the table now pulls open to reveal felt-lined storage space undeneath to hold the game pieces. The table is about 40 inches across. The artwork is applied with a combination of inks and paints. 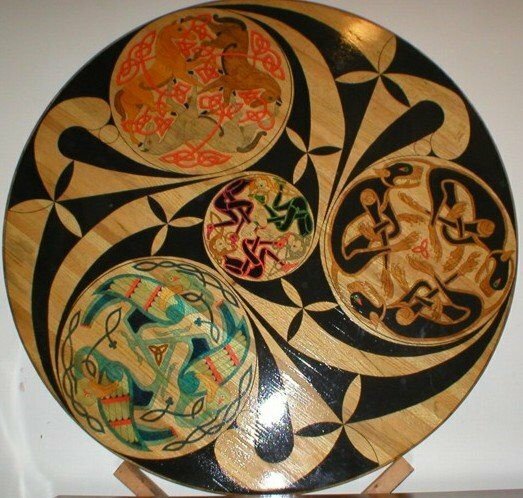 For the colors, I often use inks, or stains which are not opaque so that the beauty of the wood grain shows through the color and gives the illusion that it is actually inlaid marquetry work. The artwork is then sealed with numerous coats of high quality polyurethane. 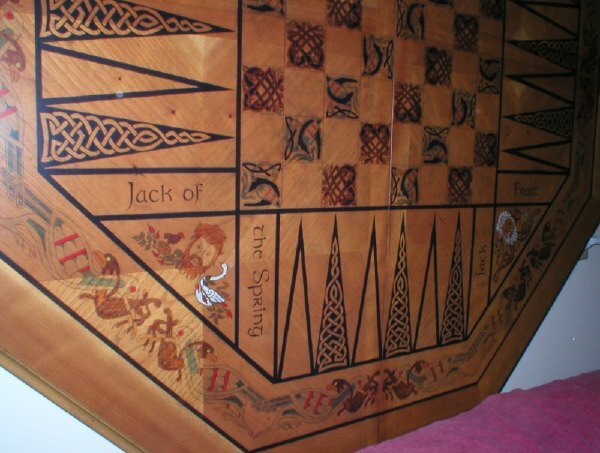 The Bird & Dog patterns in the chess board are inspired by similar designs in the Book of Kells.The knotwork pattern in the Backgammon board was an expansion of a design I had created for our portable Backgammon set. 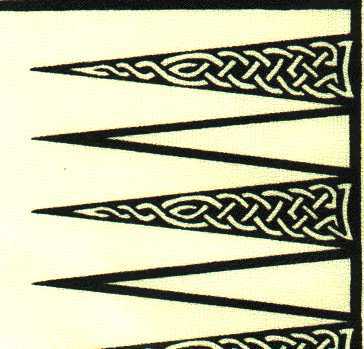 The pattern of large and small birds around the edge of the table is also inspired by a design in the Book of Kells. 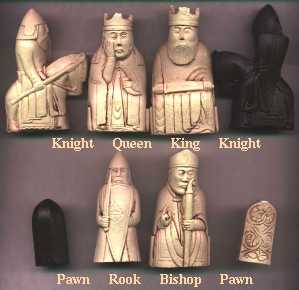 Included with the table is a reproduction of the Isle of Lewis Chessmen, Celtic-art game pieces for playing the Backgammon game, as well as a complete set of our historic dice, playing cards and game rule booklets. The asking price for the whole package is $2000.00. We will deliver the table free anywhere in St. Paul/Minneapolis metro area, or for the cost of the gas anywhere within 500 miles of Minneapolis. Anywhere else, E-mail us about shipping costs. A Video look at my artwork.